A permanent display site has been chosen for The Myth of Tomorrow, a landmark in post-war Japanese art painted by Taro Okamoto. 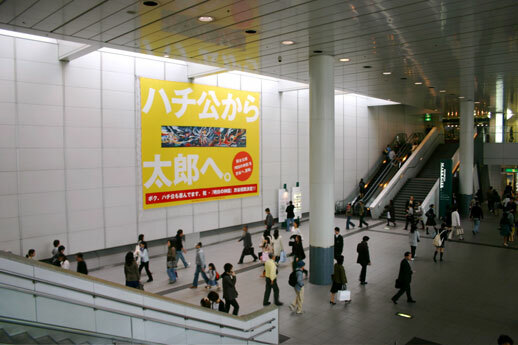 Despite hard-fought campaigns by citizens’ groups in Hiroshima and Nagasaki and an appeal from Osaka to have it displayed with the artist’s other enormous creation of 1968, the Tower of the Sun, the mural’s owners at the Taro Okamoto Museum decided that a walkway connecting the JR and Inokashira Lines in Shibuya’s Mark City was the best candidate site to display the giant, 30 metre-long mural from 2011. The Myth of Tomorrow, which depicts the flesh being torn from a human skeleton by an atomic blast, is Okamoto’s statement against the proliferation of nuclear weapons which, by making total destruction possible at any time, place the future in doubt. While it may seem incongruous today that The Myth of Tomorrow was commissioned for the lobby of a high-rise Mexico City hotel, such politicised statements in everyday places were a common goal of the Mexican muralist movement of the time. Okamoto was working on the mural at the same time as his heavy involvement with the Osaka Expo of 1970, frequently jetting back and forth between Mexico and Japan. However, before the mural could be completed, the hotel owner ran out of money and work was abandoned. In 2003, the mural was finally discovered in pieces in a suburban warehouse in Mexico City by Okamoto’s widow Toshiko. Restoration work was completed by 2006 when it went on public display in Tokyo’s Shiodome in time for the ‘Taro boom’ among young Japanese discovering the artist’s bold contributions to the Osaka Expo for the first time. In fact, Osaka’s bid to become the permanent site was always the most tenuous as there is no real connection between the mural and the Expo other than a temporal one. So why Tokyo and not one of the two cities directly affected by nuclear warfare? Given that the people of Tokyo have already had their chance to see the mural during its year-long display at the Museum of Contemporary Art, Tokyo, and taking into account the capital’s bounteous other art attractions, the decision seems a strange one. Apparently, Shibuya offered the best balance of display conditions, enthusiasm for the mural and proximity to Okamoto’s birthplace of Kanagawa. Reading between the lines of that bland pronouncement, it would appear that the defining factor was the generalised anti-proliferation message of the painting and its lack of a direct visual reference to either bombed city. The mural’s owners couldn’t choose between Hiroshima and Nagasaki without appearing to downplay the significance of one or the other and so opted for neither. In addition, had Hiroshima or Nagasaki city officials’ enthusiasm for the mural matched that of the grassroots campaigns of their citizens from the outset, the result could have been swayed by top-level pressure. 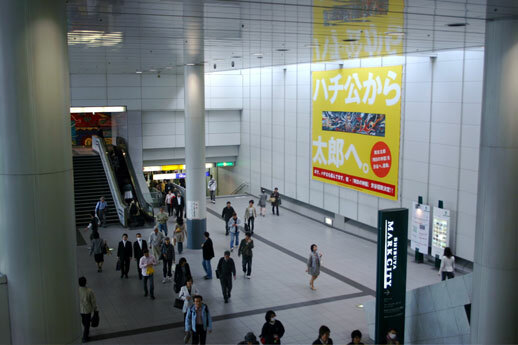 As it is, Shibuya was offering a readymade space and the least political decision. A poster is already heralding the mural’s arrival in Mark City but Tokyo commuters will have to wait another three years before the real thing animates their daily shuffle between trains.